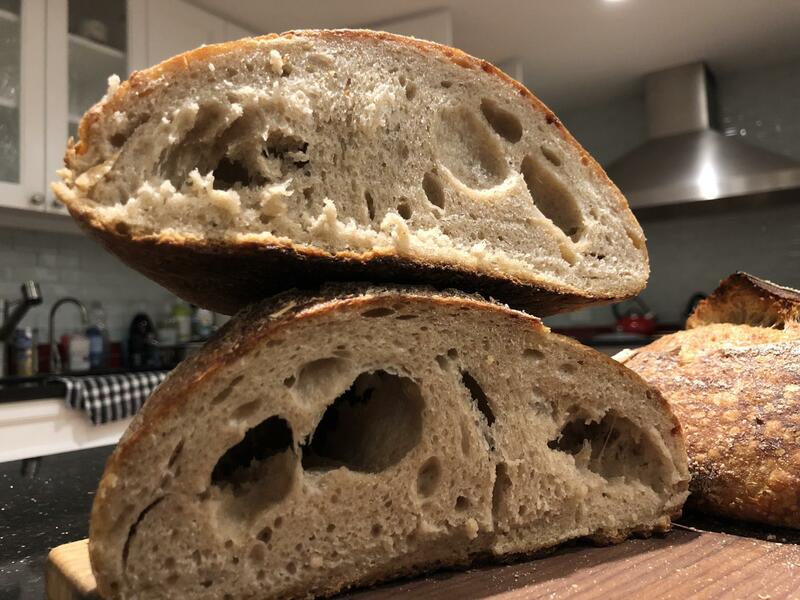 Massive air pockets in loaf - thoughts? This is a picture of the crumb of my first ever sourdough loaf. Used Maurizio's beginner sourdough recipe from perfectloaf blog. Any thoughts as to what caused this massive air bubble? The bread was incredibly delicious, great crust, and just really happy with all around - except it is very hollow inside, as you can see in this picture. Any thoughts and suggestions greatly appreciated! It's a textbook case of underfermented dough. Agree, classic underproof. One of every SD baker's first three loaves look this way. and shaping is the problem here. There is lots of gas in the crumb surrounding the large bubbles. While shaping, any large bubbles you can see, and more importantly any you can feel inside the dough (they are softer and give more than the surrounding dough) will get bigger as the dough proofs and expand more with the heat of the oven. Pop them or divide them up with handling so the crumb bubbles are more evenly distributed. A primary purpose of punching down the dough during and at the end of bulk fermentation is to make smaller holes out of big holes. To the degree that you punch down determines the size of the vacuoles. I make primarily sandwich breads, so punch down with authority. For artisan style breads, I am more 'delicate'. Really large bubbles may often be simply punctured by pinching. when i compare my loaves to Maurizio's results, one of the things i've attributed is starter strength/maturity. i've gotten much better at preparing for an upcoming bake, but sometimes my window is so tight, i have to use my starter with less ooomph than is ideal (and certainly less than his). i often have to give my dough another 30 minutes and an extra S&F as compared to his schedule because of this. i like to see bubbles on the surface of my dough after bulk before i shape and pop em in the fridge. i've baked his beginner loaf before with good results. i agree with comments above, this dough looks like it could have used longer fermentation. did you follow his method and timelines for bulk/overnight proof? i often have to adjust my baking schedule over the weekend. lately i've been doing a shorter bulk fermentation, long cold proof in the fridge, and then on bake day i shape and proof on the counter for at least hour and half, preferably two hours. Thanks for all these very helpful comments. Sounds like I needed to give it both more time during bulk, maybe another stretch and fold, and more vigorous shaping, and longer proof. I followed his timing suggestions, but could have been in a slightly cooler kitchen than his. The dough was in bulk for ~4 hours and in the fridge proofing for ~16 hours, as he recommends. Perhaps I will take the dough out of the fridge and let it proof on the counter for a few hours at room temp before baking next time.